Get Off the Couch: Marking off the #1 thing on my list! Marking off the #1 thing on my list! I don't think there is anything like the feeling of marking off a bucket list item that you've been trying to accomplish with all your heart, but I was able to do that very thing Friday night when I met Mr. JJ Watt. 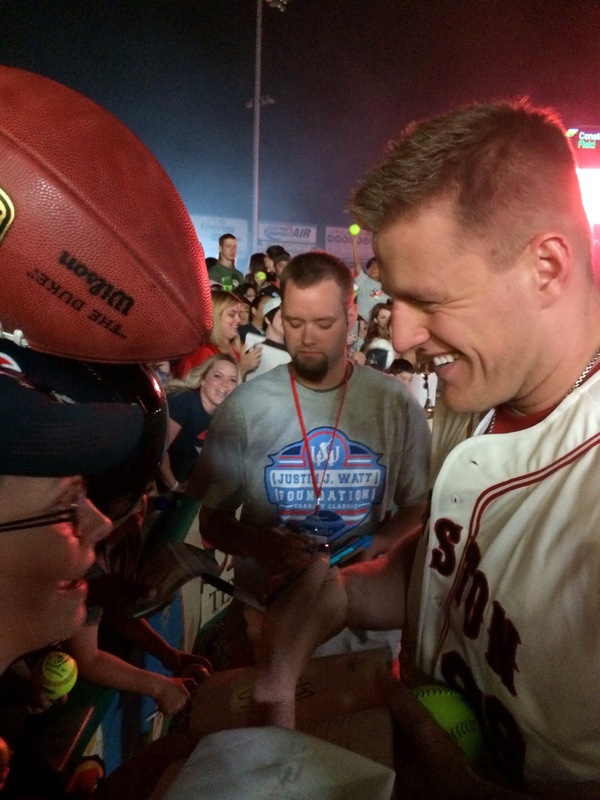 I have been on TV about my bucket listing, making sure to mention how much I wanted to meet him, and when I signed the Before I Die wall at Distinctive Life in front of a news crew, I wrote "Meet JJ Watt" as my #1 thing I wanted to do. I even carved a foam pumpkin in his likeness hoping it would buy me an "in". I was too late to the punch to get tickets to the JJ Watt Charity Classic softball game, and I really thought I had lost a golden opportunity. I would have, indeed, had it not been for the wonderful people at Charitabulls who had a contest to win 2 tickets. I won, and my husband and I were able to attend the game. I brought the pumpkin I'd carved, thinking maybe it would get his attention. I asked all the staff "If one was hoping to give JJ Watt a pumpkin carved in his likeness, how might one best do so?" and they pointed me to the JJ Watt Foundation table. I told them I wanted to donate it to them to auction off at their next event. They told me "Let me go get JJ's Mom and show her." I about had a heart attack when they said that! They couldn't find her at the time, but I promised to come back after the event and give it to them then. We found our seats, and I waited down at the bottom in hopes some players, one especially, would come by and sign things. The ladies who came up to stand next to me started chatting about the pumpkin and said they had just seen Mrs. Watt at the tables. I wasn't sure whether to go back up or wait where I was. They assured me they would save my spot, so off I went, pumpkin in hand, back to the Foundation set up. Sure enough, there she was, posing for pictures with other fans of her son. I showed her the pumpkin, as well as a picture of it lit up, and told her I wanted to give it to her to keep, or auction off, or whatever she wanted to do with it (promising to carve another for the Foundation if she chose to keep it.). She told me she loved it and would be sure to make sure he got it. I told her I was sort of hoping to meet him, but she said no, you won't be able to meet him tonight. You can give to me, or take it with you, but you can't meet him. I struggled internally for a moment, knowing if I gave it up I wouldn't have anything to grab his attention on the field, but I decided I really wanted her to have it, so I gave it up. She was kind enough to pose for a picture with me, but I really wish I'd gotten a picture of her holding the pumpkin, too. I went back down to the spot where the ladies had kept their word and saved my place. My husband, who was to be my photographer in case the big moment did happen, left to go to the restroom. Not 5 seconds after he walked off, who should run up and give me a big ole high 5? JJ Watt! As thrilled as I was to have that brief encounter, I was also a bit disappointed I didn't have any pictures or witnesses that it happened. I wasn't even sure that counted as meeting him. Soon the game started and I sat and enjoyed the show. The game only went to 7 innings, so toward the end of the 6th my husband prodded me to go back down to my spot from earlier so I could be there if the players came up to sign autographs after the game. I had to do some security guard dodging and lay a bit low, but I managed to not be chased away. The game ended, the fireworks went off, and I stood waiting. 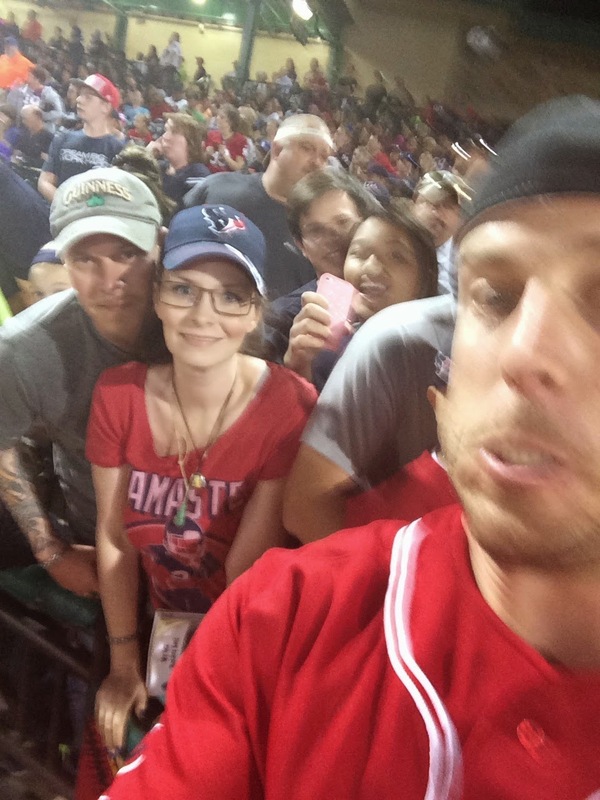 My heart sank as I watched JJ Watt go all the way to the very opposite end of the field to sign things, but I was cheered up when I saw Mr. Case Keenum heading my way. He not only signed my bucket list, he also posed for a picture with me and stole my phone and took a selfie with it, with us in the background. What a great sense of humor he had. 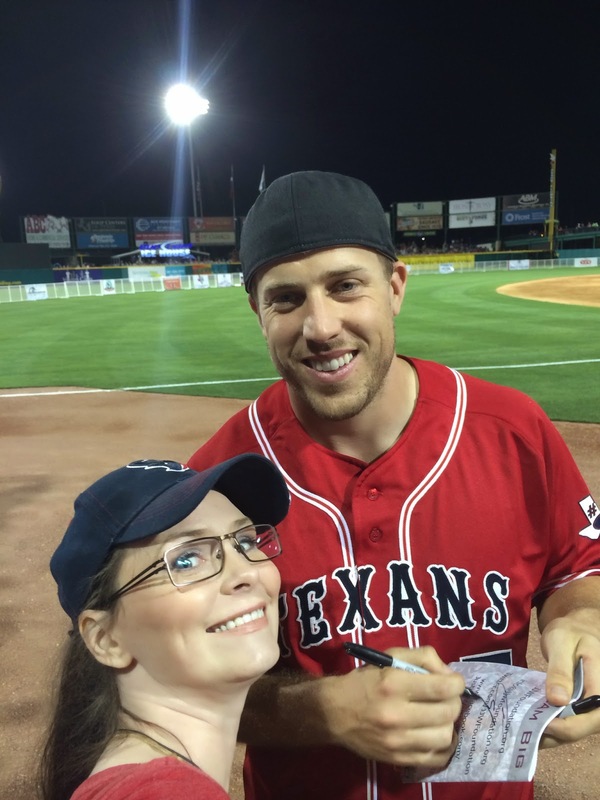 It was getting late and my husband was tired, and seeing as how JJ Watt was as far as he could possibly be away from me, I thought it was probably time to throw in the towel and just be happy that I was able to meet Keenum. Right as I was about to walk away I saw what looked to be a mountain running straight toward me. It was dark, but wasn't that mountain running from the area JJ was just signing stuff? Soon he came into view and was standing right in front of me. The crowd pushed from behind me, people were shoving footballs and photos into his hands, women were screaming "JJ I LOVE YOU!!!" at ear splitting levels. I leaned in and said "You have to sign my bucket list! You're in it!". He looked straight at me, smiled his MegaWatt smile and said "Oh that's so cool!". He signed it, upside down, but that's just fine with me. I turned to make sure my husband had captured the moment this time and he said he had. And what a picture it is. This, friends, is what it looks like to cross off your most desired bucket list item. Pure joy.